small phones are becoming more expensive every single year, and, it's not a surprise, they're becoming increasingly capable. and we're spending more time on them. consuming data at a higher rate than ever before. but there's a company called bulk Wireless who are building a smartphone that can call people and access the Internet unlimited from anywhere and for free forever. 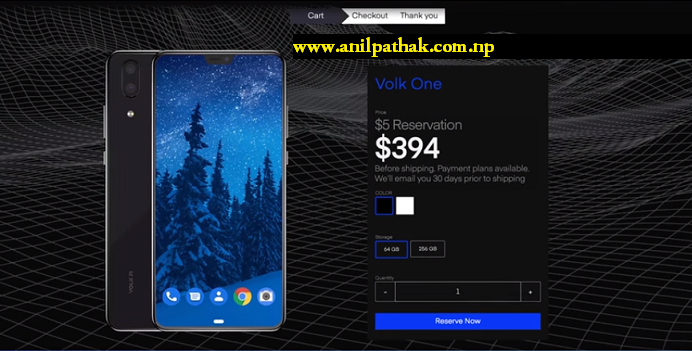 that's a concept that I can get on board with but let's see how it works when you buy the Volk one smartphone. it comes bundled with one of the companies Volk five wireless hubs kind of like a standard Wi-Fi hub. and the signal can only be picked up by Volk phones, as they have a receiver built in and so as long as you're in this range of a couple of miles, you can browse the internet and call people all without needing a SIM card. at the same time as being able to consume the internet, your phone is able to send that signal to other nearby Volk phones. so all of a sudden that Volk flies signal is able to reach much further than just a couple of miles. it forms a network of devices that are all helping each other to stay connected. we need an invite to reserve one but considering it's priced at $394 you're getting a fair bit of phone. here it's got a Snapdragon 845 four gigs of ram and in dual 16-megapixel camera plus a 6.2 inch AMOLED display and it runs the latest Android 9. I've got a few reservations the whole concept of the phone relies heavily on having this network of users. but then number two is that if it doesn't gain that traction, then the entire Volkaspect of the smartphone is useless and you're just getting an all-around average $400 small firm. it will still have a sim card slot so you can use it as a normal phone but then for that price, you can do better just from past experience the latter seems more likely. I would love to see this take off but it is gonna be very hard to convince those initial buyers to take a gamble on a company, nobody has heard of. also because this company has next to no past reputation and considering that all we're seeing are renders on the website. it's likely that the phone is barely finished and that the company are using this. whole reservation system to try and gauge the amount of demand there is before deciding whether to mass-produce or not. but if you factor in having to effectively have a continuous data hotspot on that will definitely be somewhat hindered. if you enjoy the article it'll massively appreciate it if you could share this and as always do comment your recommendation.